Estrella Mountain is a master-planned community located in Goodyear, Arizona. This community is nestled at the foothills of the Sierra Estrella Mountains. Estrella Mountain was recognized in Arizona Foothills Magazines “Best of Our Valley 2015”. 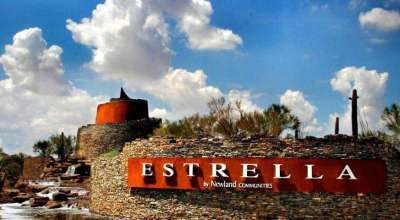 Estrella offers 72 acres of lakes and the Estrella Yacht Club offering residents free boat rentals and monthly sailing and boating safety classes. If golf is your thing, the Golf Club of Estrella is for you. The 7,102 yard, par 72 Nicklaus Design course offers a great golf experience. This course was recognized by Golfweek as one of the 2014 “Best Courses You Can Play” and continues to receive high praise as a golfing location. Nearby the community is the Estrella Mountain Regional Park which comprises of 19,840 acres of desert and mountain terrain. This park offers hiking, biking and horse trails for the adventure loves. There is also an abundance of wildlife watching opportunities in the park. The community of Estrella offers so much as a home owner.